Deep Green Resistance recently posted a new set of FAQs on the main website, addressing the myths of Green Technology & Renewable Energy. In that same vein, here’s a first-hand observation of the impacts of supposedly “clean” wind turbines on a Scottish forest fragmented by the machines and their access roads. The article makes clear the stark choice we face: industrialism or life. I’ve recently been planting trees at a wind farm. Every morning, we’ve had to drive up a forestry road and top a large hill covered in hectare upon hectare of Sitka spruce. At the top of the hill, the spruce forest has been levelled and a giant construction project has taken place. Wind turbines twenty or thirty stories high spin with alarming speed. 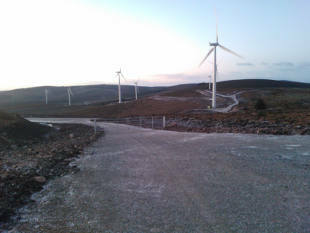 Siemens headed the project, receiving the contract to build the turbines to be owned by Scottish and Southern Energy. The resulting moonscape, crisscrossed by individual access roads, reminds me of the areal shots I’ve seen of fracked well pads dotted all over the American and Australian landscapes. Twisted interconnected roads leading nowhere in a bizarre irregular grid pattern. I guess this is the signature of new and upcoming energy extraction projects: each productive unit, whether it be wind turbine or fracking well, is only nominally productive on its own when compared to industrial demand and ‘conventional’ power plant outputs. This entry was posted in Biodiversity & Habitat Destruction and tagged Greenwashing, Scotland, Wind on December 28, 2014 by Deep Green Resistance UK.